UPDATE: This offer has expired for now, but we will post as soon as it becomes available again. Get a FREE Sample of Energems Energy Bites! 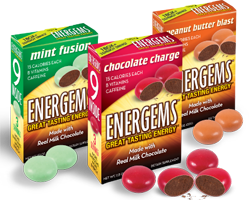 Energems supplements are bite-sized, hard-coated gems made with real milk chocolate. They contain caffeine, B-vitamins and a proprietary energy blend. Today I got a box of Snapple and my 2 orders from HSN.